Let’s face it – toddlers are a messy bunch! Leave them alone for two minutes and they’ll somehow find a way to stain the walls, floor or even themselves. From crayon marks to paint spills, there’s nothing a toddler loves more than to create a mountain of mess. The trouble is, toddler stains aren’t always easy to clean up. Depending upon what it is they’ve spilt, you could find the stain pretty tough to remove. However, there are ways to clean up even the toughest of stains. 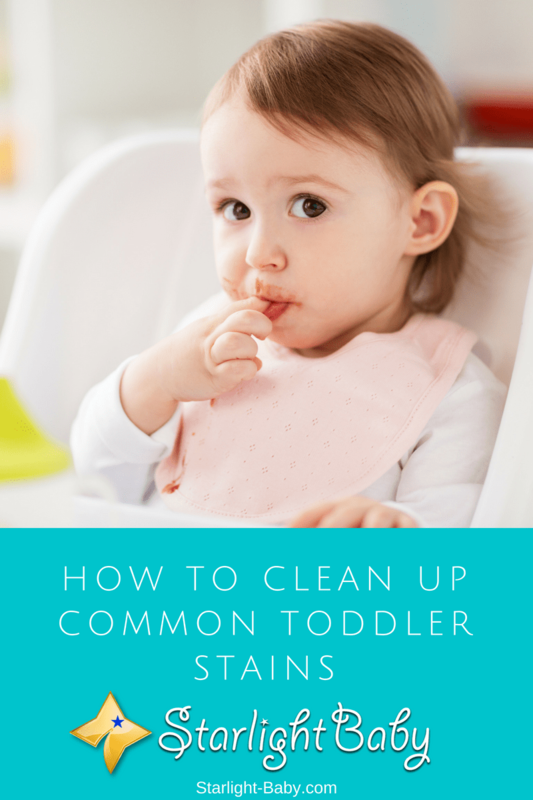 Here, you’ll discover how to clean up common toddler stains quickly and easily. They could just save you a small fortune! Out of all of the stains you’ll be forced to deal with when you’re raising a toddler, food stains are by far the most common. Often occurring on a daily basis, food stains can be a nightmare to fully eradicate. However, there are a few tricks you can use to ensure you’re not constantly having to throw your toddlers clothing away. If you’re trying to remove chocolate stains, first you’ll need to scrape away as much of the chocolate as possible. Next, use a pre-wash stain remover before running the clothing through the washing machine on a standard cycle. If the stain still refuses to budge, wash the clothing again with a fabric-safe bleach. Another common food stain you’ll often be faced with is ketchup. Again, it’s a good idea to start by scraping off as much of the ketchup as you can. Turn the clothing inside-out and rinse behind the stain with cold water. Next, return to the front of the stain and apply a little liquid detergent before tapping it with a clean, unused toothbrush. This should start to break up the stain. You can then use a little white vinegar to rub into the stain, before rinsing it off with cold water. Use the same tapping method and repeat the vinegar process to eliminate as much of the stain as you can. Finally, wash the clothing with a fabric-friendly bleach included in the cycle. It may seem like a lot of hard work, but it can save you a small fortune in the long-term! Stickers can be great fun for toddlers, but not so much for you when you find them stuck all over the walls, windows and carpet! The good news is, there are a few simple tricks you can use to remove them easily. If the stickers are stuck on your windows or a glass surface, simply apply a little oil such as vegetable or baby oil. Leave the sticker overnight, then lift up the corner of the sticker the next morning and gently peel it away. Alternatively, you can soak the sticker using a sponge and hot soapy water. If the stickers are stuck on the walls however, it’s best to use a heat gun to loosen them up. You could use a hairdryer too, but that could damage the paint. The heat gun will gently heat the glue of the stickers, making them really easy to remove. It’s worth noting if you are using a heat gun, you only need to use it for approximately 5 seconds on each sticker. If you do it any longer than that, it will remove the paint. Fruit juice, when served in small quantities, can be a great, healthy drink for toddlers. However, it’s also easily spilt! Fruit juice stains are a common and frustrating issue for parents, especially the darker colored juices. If your toddler spills the juice all down their clothing, remove it as soon as possible and soak them in cold water for approximately 30 minutes. Apply white vinegar onto the stain with a sponge and leave it for another 30 minutes at least. The longer you leave it, the better. Finally, stick the clothes in the washing machine and run on a standard wash cycle. To your toddler, the whole house is their canvas when it comes to crayons! They’re particularly fond of using them on nice, clean walls. As any parent knows, waxy crayon stains can be an absolute nightmare to remove. However, there are a couple of tricks you can try. For crayon stains on the wall, WD-40 can work amazingly well. All you need to do is spray it onto the crayon mark, then wipe away with a cloth. The best thing about this tip is that WD-40 will not damage paint or most wallpapers. It can also be used to remove other stains such as marker and crayon marks on furniture. A non-gel toothpaste can also work miracles at removing crayon stains from the wall. Apply the toothpaste to the stain and then scrub it in with a clean toothbrush. The toothpaste contains a very fine abrasive which will successfully remove the crayon without damaging the wall. Don’t forget to rinse it off after you’ve finished. If your toddler has got their hands on a marker pen, you may be facing a serious clean-up operation! Ink stains can be especially tough to remove, unless of course you follow a few simple tricks. If they’ve managed to get ink on their clothing, simply place it, stain-side down, on top of a towel. Gently dab the fabric with rubbing alcohol. It’s important here not to rub the alcohol into the stain, just dab it gently. Rinse, then apply a prewash stain remover before washing the clothing on a standard cycle. If the stain is on the wall, you can use either rubbing alcohol or toothpaste to remove it. Again, it’s important to never rub an ink stain as this will only cause it to look worse. Ideally, you’ll want to try the toothpaste first as this won’t cause damage to the wall. Apply the toothpaste onto a hand towel and gently dab the stain. Alternatively, if you have a hand sanitizer, you can try this instead of the toothpaste, using the same method. If neither of these solutions work, rubbing alcohol can be used to dab the stain out. So, there you have it – simple tricks to eradicate most common toddler stains. Some may take a little more effort than others, but they work a treat! Give them a go next time your toddler decides to decorate their clothes, the wall or furniture. Are You Guilty Of Making These Common Time Out Mistakes? Honestly, I learnt a lot about how one can clean up the stains on our kids clothes especially when they eat and all that. The thing is that using some of the simple tricks might look simple, but they are amazing ways to clean stains. I am definitely going to try it when I am home with my little sister when she is done eating or anything and there are stains. One other thing to consider using when a kid is eating is table cloth or feeding towel as some would like to call it. The usage of this feeding towel or table eating cloth will prevent much food stains from getting on the child’s clothes as the cloth would absorb all the food drops and dirt. None of my children eats without table cloth. It’s almost impossible to prevent one’s kids to make a mess of their food, playing toys, writing materials and so on. Most times, my wife makes use of Jik to wash their stained clothes and it helps a lot in removing the stains. But there is a catch, once the stains are done, it’s best to wash them immediately and not dump them for long to dry up. Seriously, taking care of toddlers is a lot more difficult than taking care of a baby. A baby would only car or fuss when the it’s hunger or discomforted when the child must have pooped or possibly as a result of feeling hot but a toddler can become a parent’s worst nightmare by not allowing you anytime to be at peace, not even with their eating sessions. Its hard to prevent a kid from making a mess.Every parent knows that until the age of 4/5 they will have problems and trouble with their kids not making a mess.If thought well,a child can be polite when it grows up. Thank you for making this nice article.